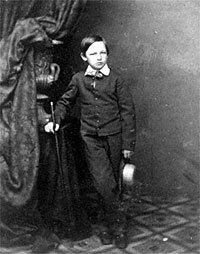 Born in 1850, Willie died on February 20, 1862 of a typhoid-like disease. His death was traumatic for the entire family. Willie was studious, personable, intelligent and creative—the child who most closely reflected his father’s personality. His death was probably caused by the contaminated water that flowed through a nearby canal that provided water for the White House and a place for White House children to play. He was attended to by Dr. Robert K. Stone, the family physician. His parents were in nearly constant attendance during his illness as Willie literally wasted away and in constant grief after his death. Mrs. Lincoln “did all a mother ought or could during Willie’s sickness—she never left his side at all after he became dangerous, & almost wore herself out with watching, and she mourns as no one but a mother can at her son’s death,” reported Benjamin B. French.4 All the folk medicines in Washington—and many were given to Willie from Peruvian bark to beef tea—could not save him. Willie’s death after a two-week illness plunged his mother into inconsolable grief. 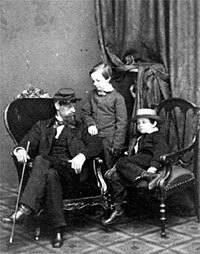 She remained in formal mourning for a year and wrote of him: “I always found my hopes concentrating on so good a boy as he.” She donated her son’s savings to the Sunday School Mission Program at New York Avenue Presbyterian Church; his whole church school class had attended the funeral. The words poet Nathaniel Parker Willis wrote about Willie in Home Journal were of great comfort to his grieving mother. This little fellow had his acquaintances among his father’s friends, and I chanced to be one of them. He never failed to seek me out in the crowd, shake hands, and make some pleasant remark; and this, in a boy of ten years of age, was, to say the least, endearing to a stranger. But he had more than mere affectionateness. His self-possession—aplomb, as the French call it— was extraordinary. I was one day passing the White House, when he was outside with a play-fellow on the side-walk. Mr. Seward drove in, with Prince Napoleon and two of his suite in the carriage; and, in a mock-heroic way—terms of intimacy evidently existing between the boy and the Secretary—the official gentleman took off his hat, and the Napoleon did the same, all making the young prince President a ceremonious salute. Not a bit staggered with the homage, Willie drew himself up to his full height, took off his little cap with graceful self-possession, and bowed down formally to the ground, like a little ambassador. They drove past, and he went on unconcernedly with his play: the impromptu readiness and good judgment being clearly a part of his nature. His genial and open expression of countenance was none the less ingenuous and fearless for a certain tincture of fun; and it was in this mingling of qualities that he so faithfully resembled his father. With all the splendor that was around this little fellow in his new home he was so bravely and beautifully himself—and that only. A wild flower transplanted from the prairie to the hothouse, he retained his prairie habits, unalterably pure and simple, till he died. His leading trait seemed to be a fearless and kindly frankness, willing that everything should be as different as it pleased, but resting unmoved in his own conscious single-heartedness. I found I was studying him irresistibly, as one of the sweet problems of childhood that the world is blessed with in rare places; and the news of his death (I was absent from Washington, on a visit to my own children, at the time) came to me like a knell heard unexpectedly at a merry-making. On the day of the funeral I went before the hour, to take a near farewell look at the dear boy; for they had embalmed him to send home to the West—to sleep under the sod of his own valley—and the coffin-lid was to be closed before the service. The family had just taken their leave of him, and the servants and nurses were seeing him for the last time— and with tears and sobs wholly unrestrained, for he was loved like an idol by every one of them. He lay with eyes closed— his brown hair parted as we had known it— pale in the slumber of death; but otherwise unchanged, for he was dressed as if for the evening, and held in one of his hands, crossed upon his breast, a bunch of exquisite flowers—a message coming from his mother, while we were looking upon him, that those flowers might be preserved for her. She was lying sick in her bed, worn out with grief and overwatching. Elizabeth Todd Grimsley, “Six Months in the White House,” Journal of the Illinois State Historical Society 19 (Oct.-Jan., 1926-27): p. 48. Julia Taft Bayne, Tad Lincoln’s Father, p. 8-9. Ruth Painter Randall, Mary Lincoln: Biography of a Marriage, p. 260. Daniel Mark Epstein, The Lincolns: Portrait of a Marriage, p. 368. Michael Burlingame, Abraham Lincoln: A Life, Volume II, p. 299. Wayne Temple: Abraham Lincoln: From Skeptic to Prophet, p. 187. Michael Burlingame, editor, Inside the White House in War Times, p. 67. Elizabeth Keckley, Behind the Scenes, p. 106-110. Ervin Chapman, Latest Light on Abraham Lincoln and War-time Memories, pp. 505-506. Benjamin Thomas, “The President Reads His Mail,” The Many Faces of Lincoln, p.132. Ruth Painter Randall, Mary Lincoln: Biography of a Marriage, p. 266. Katherine Helm, Mary, Wife of Lincoln, p. 227.